[S677] Mary J. Carter, "Callaways on the Move," The Callaway Journal, vol. 3, p. 16 (1978), p. 18 (citing Earle S. Dennis and Jane E. Smith, comp., Marriage Bonds of Bedford Co., Virginia - 1755-1800). [S724] Descendants of Joseph and Peter Callaway (n.p. : The Callaway Family Association, Inc., 2000), pp. 2-3. Other Names*: Susanna White Callaway, Susanna Callaway. [S14] "Descendants of Joseph Callaway of Virginia," The Callaway Journal, vol. 5 (1980), p. 77 (naming Stephen White as her father). [S677] Mary J. Carter, "Callaways on the Move," The Callaway Journal, vol. 3, p. 16 (1978), p. 18 (stating that her father, Stephen White, gave consent to her marriage to James Callaway, citing Earle S. Dennis and Jane E. Smith, comp., Marriage Bonds of Bedford Co., Virginia - 1755-1800). [S677] Mary J. Carter, "Callaways on the Move," The Callaway Journal, above, p. 18 (citing Earle S. Dennis and Jane E. Smith, comp., Marriage Bonds of Bedford Co., Virginia - 1755-1800). [S646] Joann Callaway, "John Callaway: Moving Westward," The Callaway Journal, vol. 12, p. 32 (1987) (quoting from a 2 Aug 1840 letter written by son John in which he said his mother was very frail but still alive). [S14] "Descendants of Joseph Callaway of Virginia," above, pp. 77, 80 (indicating that Susanna White was his mother). [S14] "Descendants of Joseph Callaway of Virginia," above, pp. 77, 80 (indicating that Susanna White was her mother). [S646] Joann Callaway, "John Callaway: Moving Westward," above (naming Susannah White as his mother). Other Names*: Mary Arnold Callaway, Mary Callaway. [S961] Find A Grave, online at http://www.findagrave.com, memorial for Micajah Callaway, memorial no. 20934950, viewed on 14 Oct 2013 (not giving the date). [S961] Find A Grave, online, above, memorial for Mary Arnold Callaway, memorial no. 99960880, viewed on 14 Oct 2013 (not giving the date). [S961] Find A Grave, online, above, memorial for Mary Arnold Callaway, memorial no. 99960880, viewed on 14 Oct 2013. [S961] Find A Grave, online, above, memorial for James Callaway, memorial no. 62319581, viewed on 23 Oct 2013 (naming Mary Arnold as his mother). Other Names*: Frances Hawkins, Franky Hawkins, Frances Hawkins Callaway, Franky Hawkins Callaway, Frances Callaway, Franky Callaway. [S961] Find A Grave, online at http://www.findagrave.com, memorial for Frances 'Franky' Hawkins Callaway, memorial no. 60387422, viewed on 14 Oct 2013. [S961] Find A Grave, online, above, memorial for Micajah Callaway, memorial no. 20934950, viewed on 14 Oct 2013 (not giving the date or place). [S961] Find A Grave, online, above, memorial for Frances 'Franky' Hawkins Callaway, memorial no. 60387422, viewed on 14 Oct 2013 (not giving the date or place). [S14] "Descendants of Joseph Callaway of Virginia," above, p. 80 (naming Franky Hawkins as his mother). [S410] Biography of John H. Callaway, online http://www.starbase21.com/kybiog/bourbon/callaway.jh.txt, viewed on 11 Apr 1998, citing History of Lawrence, Orange and Washington Counties, Indiana from the Earliest Time to the Present (Chicago, Ill.: Goodspeed Bros. & Co., 1884), (naming Frankie Hawkins as his mother). [S411] Biography of Noble Callaway, online http://www.starbase21.com/kybiog/bourbon/callaway.n.txt, viewed on 11 Apr 1998, citing History of Lawrence, Orange and Washington Counties, Indiana from the Earliest Time to the Present (Chicago, Ill.: Goodspeed Bros. & Co., 1884), (naming Frankie Hawkins as his mother). [S961] Find A Grave, online, above, memorial for Noble Callaway, memorial no. 60690683, viewed on 23 Oct 2013 (naming Frances 'Franky' Hawkins as his mother). [S961] Find A Grave, online, above, memorial for Frances 'Franky' Hawkins Callaway, memorial no. 60387422, viewed on 23 Oct 2013 (naming Frances 'Franky' Hawkins as his mother). [S14] "Descendants of Joseph Callaway of Virginia," The Callaway Journal, vol. 5 (1980), p. 77 (naming John Galloway as her father). [S677] Mary J. Carter, "Callaways on the Move," The Callaway Journal, vol. 3, p. 16 (1978), p. 18 (stating that her father, John Galloway, gave consent to her marriage to Chesley Callaway, citing Earle S. Dennis and Jane E. Smith, comp., Marriage Bonds of Bedford Co., Virginia - 1755-1800). [S265] James E. Calloway, "Virginia--Kentucky--Missouri," The Callaway Journal, vol. 10, p. 30 (1985), p. 33. [S265] James E. Calloway, "Virginia--Kentucky--Missouri," above, (noting that "Andrew has sometimes been listed as one of the children but as there is so little information about him, he appears mystical"). [S14] "Descendants of Joseph Callaway of Virginia," above, p. 80 (indicating that Christina Galloway was his mother). [S265] James E. Calloway, "Virginia--Kentucky--Missouri," above, (naming Christina Galloway as his mother). [S265] James E. Calloway, "Virginia--Kentucky--Missouri," above, (giving her name as Sara and naming Christina Galloway as her mother). [S265] James E. Calloway, "Virginia--Kentucky--Missouri," above, (giving her name as France and naming Christina Galloway as her mother). [S265] James E. Calloway, "Virginia--Kentucky--Missouri," above, (naming Christina Galloway as her mother). Death*: He died before 1789. [S14] "Descendants of Joseph Callaway of Virginia," The Callaway Journal, vol. 5 (1980), p. 77 (giving 1 Jun 1781 as the date and naming the place). [S105] The Callaway Journal, vol. 1 (1976), p. 57 (giving only the date). [S677] Mary J. Carter, "Callaways on the Move," The Callaway Journal, vol. 3, p. 16 (1978), p. 18 (giving her name as Polly and citing Earle S. Dennis and Jane E. Smith, comp., Marriage Bonds of Bedford Co., Virginia - 1755-1800). [S105] The Callaway Journal, vol. 1 (1976), p. 57 (naming William North as his father). [S14] "Descendants of Joseph Callaway of Virginia," The Callaway Journal, vol. 5 (1980), p. 77 (giving the date as 1789/90). [S252] Bobbie L. Callaway, "Flanders: Legend and His Legacy," The Callaway Journal, vol. 10, p. 18 (1985), p. 19. [S105] The Callaway Journal, vol. 1 (1976), p. 57 (stating that they married in Kentucky "about 1789/90, probably in Fayette County"). [S105] The Callaway Journal, vol. 1 (1976), p. 57 (spelling her name as Paulina and naming Joshua Baker as her father). [S105] The Callaway Journal, vol. 1 (1976), p. 57 (spelling her name as Pamelia and naming Joshua Baker as her father). [S105] The Callaway Journal, vol. 1 (1976), p. 57 (naming Joshua Baker as his father). [S14] "Descendants of Joseph Callaway of Virginia," The Callaway Journal, vol. 5 (1980), p. 77 (naming David Mitchell as her father). [S677] Mary J. Carter, "Callaways on the Move," The Callaway Journal, vol. 3, p. 16 (1978), p. 19 (citing "Mason Co. KY mgs. of 1788-1851"). [S542] Jill DeGraeve-Cruse, "The Callaway Family," online http://www.zianet.com/schulthe/Genes/Calloway/reports/…, viewed on 12 Nov 1998. [S14] "Descendants of Joseph Callaway of Virginia," The Callaway Journal, vol. 5 (1980), p. 77 (giving her name as Athaliah Wright). [S724] Descendants of Joseph and Peter Callaway (n.p. : The Callaway Family Association, Inc., 2000), p. 3 (naming Charles Callaway as his father). [S724] Descendants of Joseph and Peter Callaway, above, p. 3 (naming Ann _____ as his mother). [S105] The Callaway Journal, vol. 19, p. 39 (1994) (identifying Thomas Callaway as an heir to Joseph Callaway, deceased in a 27 Jan 1833 consent to a 2 Jul 1831 land certificate recorded in Deed Book R, pp. 476-77, Callaway Co., Mo.). [S724] Descendants of Joseph and Peter Callaway (n.p. : The Callaway Family Association, Inc., 2000), p. 4 (naming Joseph Callaway as his father). [S724] Descendants of Joseph and Peter Callaway, above, p. 4 (naming Polly Barrett as his mother). [S105] The Callaway Journal, vol. 19, p. 40 (1994) (stating, on 27 May 1878, in a widow's claim for War of 1812 service that they married on 25 Dec 1813 in Smith Co., Tenn.) (conflicting with her 27 May 1871 claim, in which she stated that they were married in Dec 1810 in Wilson Co., Tenn.). [S724] Descendants of Joseph and Peter Callaway, above, p. 4 (stating that their place of marriage was either Smith or Wilson County, Tennessee). [S105] The Callaway Journal, vol. 19, p. 39-40 (1994) (two widow's claims for War of 1812 service, signed by Celia Callaway in Callaway Co., Mo., by her mark, on 27 May 1871 and 27 May 1878). [S105] The Callaway Journal, vol. 19, p. 40 (1994) (secondary proof for widow's claim for War of 1812 service, signed by Celia Callaway in Callaway Co., Mo., on 27 May 1878) (indicating that Thomas Callaway was Minerva's father). [S105] The Callaway Journal, vol. 19, p. 40 (1994) (secondary proof for widow's claim for War of 1812 service, signed by Celia Callaway in Callaway Co., Mo., on 27 May 1878) (indicating that Thomas Callaway was Nancy's father). [S105] The Callaway Journal, vol. 19, p. 40 (1994) (secondary proof for widow's claim for War of 1812 service, signed by Celia Callaway in Callaway Co., Mo., on 27 May 1878) (indicating that Thomas Callaway was Martha's father). [S14] "Descendants of Joseph Callaway of Virginia," The Callaway Journal, vol. 5 (1980), p. 77 (giving the date and state but not naming the county). 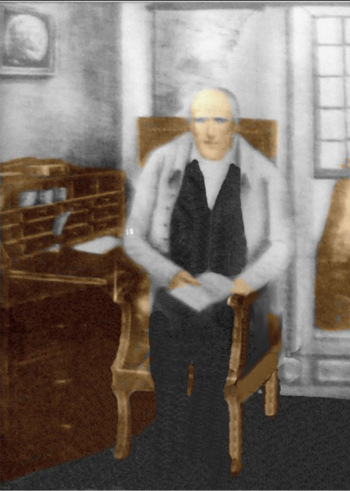 [S724] Descendants of Joseph and Peter Callaway, above, p. 4 (stating that he served in the War of 1812). [S105] The Callaway Journal, vol. 19, p. 39 (1994) (identifying Joseph Callaway as an heir to Joseph Callaway, deceased in a 27 Jan 1833 consent to a 2 Jul 1831 land certificate recorded in Deed Book R, pp. 476-77, Callaway Co., Mo.). [S14] "Descendants of Joseph Callaway of Virginia," above, p. 77 (giving circa 1822 as the date). [S724] Descendants of Joseph and Peter Callaway, above, p. 4 (stating that he was born "c1804/05" in Greenville County, South Carolina). [S724] Descendants of Joseph and Peter Callaway, above, p. 4 (identifying her as "Margaret ? Brown, widow"). [S724] Descendants of Joseph and Peter Callaway, above, p. 4 (stating that his middle name probably was Vinson but may have been Vincent). [S105] The Callaway Journal, vol. 19, p. 39 (1994) (identifying Tabitha Callaway as natural guardian for the heirs of William Callaway, deceased and as heirs to Joseph Callaway, deceased in a 27 Jan 1833 consent to a 2 Jul 1831 land certificate recorded in Deed Book R, pp. 476-77, Callaway Co., Mo.). [S14] "Descendants of Joseph Callaway of Virginia," The Callaway Journal, vol. 5 (1980), p. 77 (not giving the date or place). [S105] The Callaway Journal, vol. 19, p. 39 (1994) (not giving the date or place and identifying Tabitha Callaway as natural guardian for the heirs of William Callaway, deceased and as heirs to Joseph Callaway, deceased in a 27 Jan 1833 consent to a 2 Jul 1831 land certificate recorded in Deed Book R, pp. 476-77, Callaway Co., Mo.). [S14] "Descendants of Joseph Callaway of Virginia," above, p. 77 (stating that he died before 1840 in Missouri). [S105] The Callaway Journal, vol. 19, p. 39 (1994) (stating that he died before 1833 in Missouri and identifying Tabitha Callaway as natural guardian for the heirs of William Callaway, deceased and as heirs to Joseph Callaway, deceased in a 27 Jan 1833 consent to a 2 Jul 1831 land certificate recorded in Deed Book R, pp. 476-77, Callaway Co., Mo.). [S105] The Callaway Journal, vol. 19, p. 39 (1994). [S105] The Callaway Journal, vol. 19, p. 39 (1994) (identifying Polly Rankin, formerly Polly Callaway, as an heir to Joseph Callaway, deceased in a 27 Jan 1833 consent to a 2 Jul 1831 land certificate recorded in Deed Book R, pp. 476-77, Callaway Co., Mo.). [S724] Descendants of Joseph and Peter Callaway (n.p. : The Callaway Family Association, Inc., 2000), p. 4 (naming Joseph Callaway as her father). [S724] Descendants of Joseph and Peter Callaway, above, p. 4 (naming Polly Barrett as her mother). [S105] The Callaway Journal, vol. 19, p. 40 (1994) (naming Mary Callaway Coats as his mother). Family 2: William Coats Jr.
[S724] Descendants of Joseph and Peter Callaway, above, p. 4 (stating that she was born "c1799/1800"). [S105] The Callaway Journal, vol. 19, p. 39 (1994) (stating on 27 May 1871, in a widow's claim for War of 1812 service, that she was 82 years old). [S105] The Callaway Journal, vol. 19, p. 39 (1994) (stating, on 27 May 1871, in a widow's claim for War of 1812 service that they married in December 1810 in Wilson Co., Tenn.) (conflicting with her 27 May 1878 claim, in which she stated that they were married on 25 Dec 1813 in Smith Co., Tenn.). [S105] The Callaway Journal, vol. 19, p. 40 (1994) (secondary proof for widow's claim for War of 1812 service, signed by Celia Callaway in Callaway Co., Mo., on 27 May 1878) (naming Celia Callaway as her mother). [S105] The Callaway Journal, vol. 19, p. 40 (1994) (secondary proof for widow's claim for War of 1812 service, signed by Celia Callaway in Callaway Co., Mo., on 27 May 1878) (indicating that Celia Callaway was her mother). [S14] "Descendants of Joseph Callaway of Virginia," The Callaway Journal, vol. 5 (1980), p. 77 (giving circa 1822 as the date). [S14] "Descendants of Joseph Callaway of Virginia," The Callaway Journal, vol. 5 (1980), p. 77 (naming Rev. William Coats as her father). [S724] Descendants of Joseph and Peter Callaway (n.p. : The Callaway Family Association, Inc., 2000), p. 4 (naming Rev. William Coats as her father). [S14] "Descendants of Joseph Callaway of Virginia," above, p. 77 (naming Rev. William Coats as her father). [S724] Descendants of Joseph and Peter Callaway, above, p. 4 (naming Rev. William Coats as his father). [S724] Descendants of Joseph and Peter Callaway (n.p. : The Callaway Family Association, Inc., 2000), p. 4 (naming Rev. William Coats as his father). [S105] The Callaway Journal, vol. 19, p. 40 (1994) (naming James Coats as his father). [S724] Descendants of Joseph and Peter Callaway (n.p. : The Callaway Family Association, Inc., 2000), p. 4 (naming Charles Hodges, Sr. as his father). [S677] Mary J. Carter, "Callaways on the Move," The Callaway Journal, vol. 3, p. 16 (1978), p. 18 (stating that her father, James Callaway, gave consent to her marriage to Harry Innes, citing Earle S. Dennis and Jane E. Smith, comp., Marriage Bonds of Bedford Co., Virginia - 1755-1800). [S724] Descendants of Joseph and Peter Callaway (n.p. : The Callaway Family Association, Inc., 2000), pp. 4-5 (naming Col. James Callaway as her father). [S724] Descendants of Joseph and Peter Callaway, above, p. 5 (naming Sarah Tate as her mother). [S724] Descendants of Joseph and Peter Callaway, above, p. 5 (spelling his surname as Innis). [S105] The Callaway Journal, vol. 1 (1976), p. 57 (naming Col. James Callaway as her father). [S724] Descendants of Joseph and Peter Callaway, above, p. 5 (stating that she was born in 1759 in Virginia). [S724] Descendants of Joseph and Peter Callaway, above, p. 5 (giving only the year). [S714] Mary P. Funkhouser, "A Callaway Tour of Bedford County [Virginia]," The Callaway Journal, vol. 4, p. 18 (1979), p. 19 (naming Col. James Callaway as her father). [S714] Mary P. Funkhouser, "A Callaway Tour of Bedford County [Virginia]," The Callaway Journal, above, p. 19 (naming Sarah Tate as her mother). [S14] "Descendants of Joseph Callaway of Virginia," above, p. 77 (giving only the year). [S714] Mary P. Funkhouser, "A Callaway Tour of Bedford County [Virginia]," The Callaway Journal, above, p. 24. [S14] "Descendants of Joseph Callaway of Virginia," above, p. 77 (giving the year, county, and state). [S714] Mary P. Funkhouser, "A Callaway Tour of Bedford County [Virginia]," The Callaway Journal, above, p. 24 (citing grave marker and giving the month and year but not the place). [S714] Mary P. Funkhouser, "A Callaway Tour of Bedford County [Virginia]," The Callaway Journal, above, p. 24 (citing grave marker inscription that she was forty-five years old when she died in Dec 1807). [S677] Mary J. Carter, "Callaways on the Move," The Callaway Journal, vol. 3, p. 16 (1978), p. 18 (stating that they married on 14 Feb 1781 in Bedford County, Virginia, citing Earle S. Dennis and Jane E. Smith, comp., Marriage Bonds of Bedford Co., Virginia - 1755-1800). [S714] Mary P. Funkhouser, "A Callaway Tour of Bedford County [Virginia]," The Callaway Journal, above, p. 19 (naming Frances Callaway as his mother). [S714] Mary P. Funkhouser, "A Callaway Tour of Bedford County [Virginia]," The Callaway Journal, above, p. 19 (naming Frances Callaway as her mother). [S714] Mary P. Funkhouser, "A Callaway Tour of Bedford County [Virginia]," The Callaway Journal, above, p. 24 (naming Frances Callaway as his mother). [S714] Mary P. Funkhouser, "A Callaway Tour of Bedford County [Virginia]," The Callaway Journal, above, p. 20 (naming Fanny Callaway as her mother). [S724] Descendants of Joseph and Peter Callaway (n.p. : The Callaway Family Association, Inc., 2000), p. 5 (spelling his surname as Innis). James Steptoe, courtesy of Robert "Scott" Patrick. • His Find A Grave memorial is here. It includes a picture of his grave marker. • Pictures of the Callaway-Steptoe Cemetery, including a historical marker, are here. Click on a picture to enlarge it. [S714] Mary P. Funkhouser, "A Callaway Tour of Bedford County [Virginia]," The Callaway Journal, vol. 4, p. 18 (1979), pp. 19 (giving the date and place), 24 (not giving the date or place but citing grave marker inscription that he was seventy-six years old when he died in Feb 1826). [S961] Find A Grave, online at http://www.findagrave.com, memorial for James Steptoe, Sr., memorial no. 14091928, viewed on 15 Mar 2014. [S714] Mary P. Funkhouser, "A Callaway Tour of Bedford County [Virginia]," The Callaway Journal, above, p. 24 (citing grave marker). [S714] Mary P. Funkhouser, "A Callaway Tour of Bedford County [Virginia]," The Callaway Journal, above, pp. 19, 24 (citing grave marker as to court service). [S714] Mary P. Funkhouser, "A Callaway Tour of Bedford County [Virginia]," The Callaway Journal, above, p. 19 (naming James Steptoe as his father). [S714] Mary P. Funkhouser, "A Callaway Tour of Bedford County [Virginia]," The Callaway Journal, above, p. 19 (naming James Steptoe as her father). [S714] Mary P. Funkhouser, "A Callaway Tour of Bedford County [Virginia]," The Callaway Journal, above, p. 24 (naming James Steptoe as his father). [S714] Mary P. Funkhouser, "A Callaway Tour of Bedford County [Virginia]," The Callaway Journal, above, pp. 20, 24 (naming James Steptoe as her father). [S14] "Descendants of Joseph Callaway of Virginia," The Callaway Journal, vol. 5 (1980), p. 77 (naming Col. James Callaway as her father). [S14] "Descendants of Joseph Callaway of Virginia," above, p. 77 (naming Sarah Tate as her mother). [S14] "Descendants of Joseph Callaway of Virginia," above, p. 77 (stating that she had no children). [S724] Descendants of Joseph and Peter Callaway, above, p. 5 (stating that she never married). [S724] Descendants of Joseph and Peter Callaway (n.p. : The Callaway Family Association, Inc., 2000), pp. 4-5 (naming Col. James Callaway as his father). [S14] "Descendants of Joseph Callaway of Virginia," The Callaway Journal, vol. 5 (1980), p. 77 (naming Col. James Callaway as his father). [S724] Descendants of Joseph and Peter Callaway, above, p. 5 (naming Sarah Tate as his mother). [S14] "Descendants of Joseph Callaway of Virginia," above, p. 77 (naming Sarah Tate as his mother). [S647] Mary DuPree, "Lavinia Is Remembered," The Callaway Journal, vol. 12, p. 25 (1987), (not giving the date). [S647] Mary DuPree, "Lavinia Is Remembered," above, (stating that he was born in Franklin County, Virginia but not giving the date). [S647] Mary DuPree, "Lavinia Is Remembered," above, (naming James Callaway as his father). [S724] Descendants of Joseph and Peter Callaway (n.p. : The Callaway Family Association, Inc., 2000), p. 5. [S647] Mary DuPree, "Lavinia Is Remembered," The Callaway Journal, vol. 12, p. 25 (1987). [S647] Mary DuPree, "Lavinia Is Remembered," above, (naming Henry Tate Callaway as her father). Death*: She died in 1773. Birth*: She was born in 1773. Note*: She may have died in 1774. [S14] "Descendants of Joseph Callaway of Virginia," The Callaway Journal, vol. 5 (1980), p. 77 (giving her death year as 1773/4).